Problem Picnic is a dice-rolling dexterity game from Scott Almes and published by Kids Table Board Gaming. 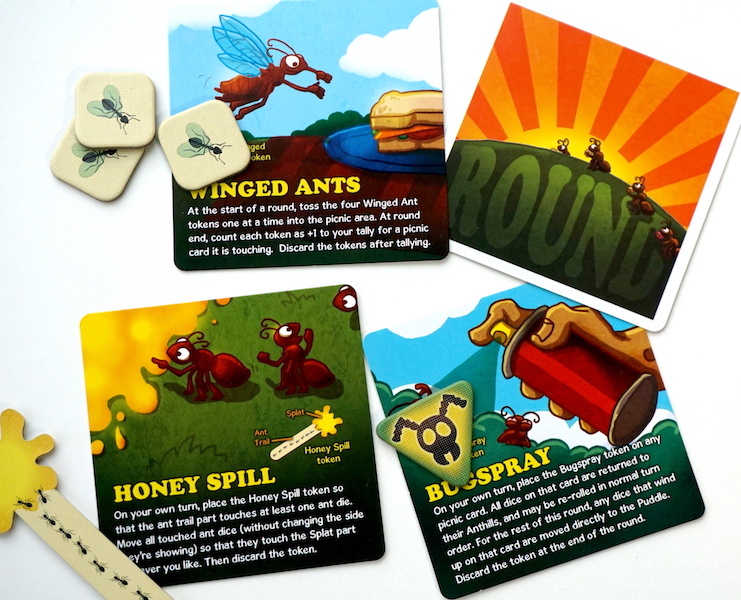 Each player controls an ant army, represented by three different kinds of dice. 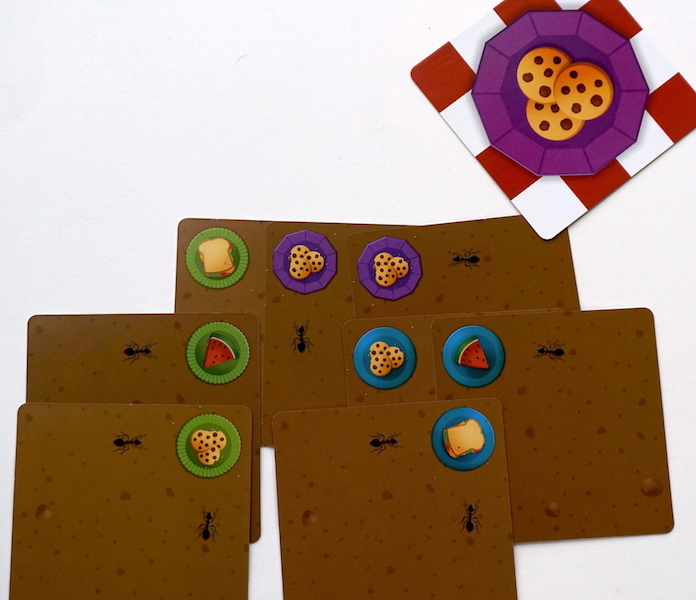 Roll your dice onto the food cards to claim them with your ants. At the end of a round, the person with the most ants showing on the dice touching a food card, claims that card. Ant dice used to claim food are sent to the “Puddle” card and are not used for the next round. Soldier ants are 12-sided dice, bigger and heavier than the other ants. They also have a special ability: even if a soldier is used to claim food, it may return to your anthill and be used again. The standard 6-sided dice are Worker ants which have no special abilities but some higher ant totals on each face. The smaller 6-sided dice are Scout ants. These ants have a special ability that allows re-rolling if the die does not touch any other dice during the roll. Your goal is two-fold: to get the most food, but also to get the right food. As you claim food, you flip over the cards and then lay them out on the table like a mosaic picture to create your “colony”. Create your colony carefully to match the Scoring cards that were drawn at the beginning of the game. After food cards have been collected and placed in a colony, the “picnic table” is refreshed with new food cards in preparation for the next round. At the end of each round the player with the least food in their colony gets a Round card. Each Round card is a one-time-use special bonus power. Most of the bonus powers move (or get rid of) ants but a few move food or give simple ant-total bonuses instead. After six rounds, it is time to determine scores. 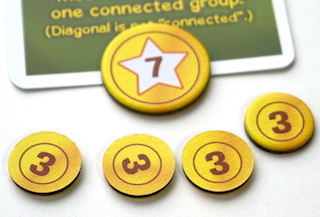 Tokens (worth 4-7 points) that were randomly placed on the Majority card and all other Scoring cards at the beginning of the game. 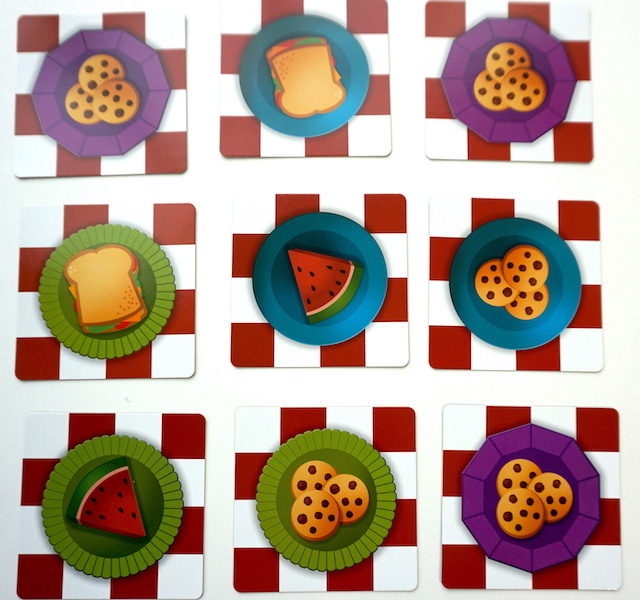 The Majority card holds tokens for the most of each kind of food and the most of each plate color. Other Scoring cards will be different for each game, but may include goals such as: “Most of one color in one connected group” or “Most foods not touching an identical food”. Each Scoring card awards a player the token that was placed on the card at the beginning. Ties are resolved by giving all tied players a 3-point token instead of the larger value. After tallying the scores, the highest scoring player wins. Problem Picnic is a cute game that is easy to learn but not always easy to play. I appreciated the “colony” layout aspect, which kept Problem Picnic from being a pure dexterity game. Generally, the player with the most food will win, but proper colony planning can make a difference in close games. Unfortunately, the die-rolling got frustrating for our family. We tried playing the game on several different surfaces, from dining room table to carpeted floor. No matter what we tried, dice would more often push the food cards around or roll right over them. A lightly-padded card table gave us the best results, but even then a rolling die would rarely stop on top of a card. When we started expecting that most dice would not go where we wanted, games went more smoothly. 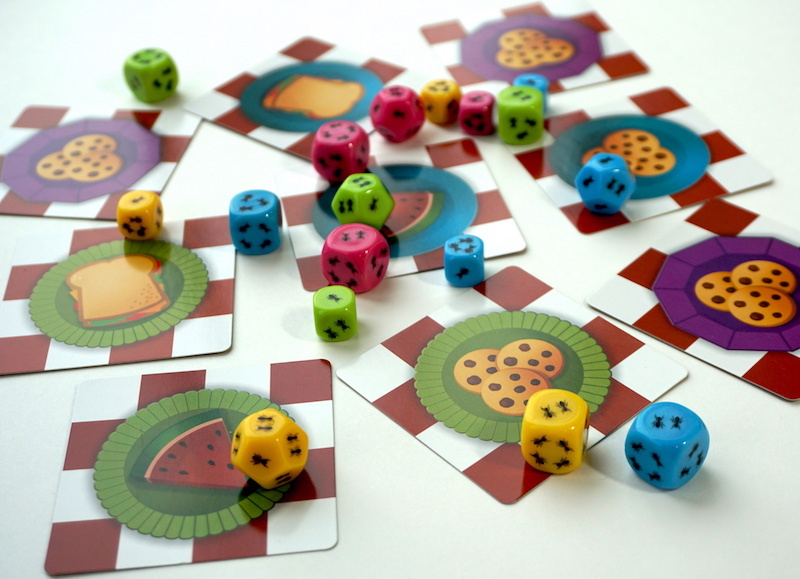 Even so, we often felt as if there should be more food cards for a larger “picnic table” to aim our dice at. The special powers given by the Round cards helped our youngest player to catch up. But players still need to use these powers strategically to maximize effectiveness. We found the game was better with higher player counts as well. The intended chaos of gameplay is better with more players, and better with older players. In fact, with regards to the game as a whole, a group of all adults who can handle the frustration of failed dexterity plays better would find the difficulty a little more manageable. In the end, Problem Picnic is a cute, fast-playing game that just wasn’t right for our family. If your family or gaming group is on the lookout for a game that combines dexterity, dice, and strategy, it might be a good game for you! Pick up Problem Picnic at Amazon or your local game store. Kids Table Board Gaming provided a copy of Problem Picnic to The Family Gamers for this review.